» What do Ground Squirrels Eat? It’s easy to answer the question where do ground squirrels eat but how about their life? How similar are they to their counterparts living on the trees? What do they eat? Though there are some convergences when it comes to the behavior of different squirrel species, there are also some unique characteristics. Before taking a look at its menu, let’s examine a couple of curious facts about the ground squirrel. Ground squirrels are dark brown and it has a short bushy tail. Just like other rodents, the ground squirrel often sits on its hind legs and keeps its noise high into the air, sniffing for food or predators. Originally, ground squirrels used to inhabit solely the prairie region. As land was cleared to the north and east, the habitat of the ground squirrels in the US expanded. Today, they can be seen in many states and people living there are familiar with the holes in the ground and the tunnels dug by the little guys. The squirrels usually create their burrows in open areas that feature medium to tall grass. The soil itself has to be either sandy or well-drained, otherwise the squirrels will be subjected to serious risks when spending time in their underground homes. Ground squirrels can be found in forests or wooded areas. Ground squirrels love fruits and they’re notorious for raiding fruit trees. Some of their menu choices of preference include apricots, apples, pears, peaches, prunes and even oranges. The squirrels aren’t going to limit themselves solely to the fruit that’s fallen to the ground. On occasions, they’ll take apples or peaches that are still on the tree. Just like their counterparts living in the trees, ground squirrels love nuts and seeds. Ground squirrels are known for collecting acorns, digging large holes in the ground and storing their supplies there. 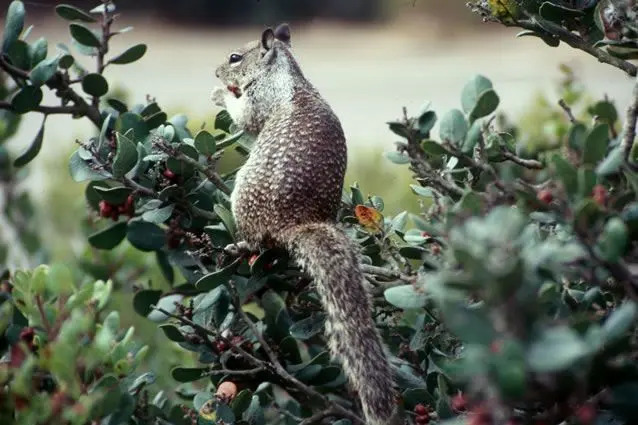 Almonds, pistachios and walnuts rank among the biggest ground squirrel favorites. Just like in the case of fruits, the little rodents are known for “attacking” such trees and collecting the nuts from the branches. When it comes to nutrition, ground squirrels don’t limit themselves just to fruits and nuts. There are a few other ingredients that they like to gather and bring to their underground burrows. Ground squirrels understand their veggies and love adding some of those to their meals. This is one of the main reasons why ground squirrels are considered pests – they can easily devour the contents of a vegetable garden. Seedlings are their absolute favorites because of the tenderness and juiciness. On top of eating seedlings, ground squirrels also like to munch on plant roots. The little rodents are also super crafty egg thieves. Ground-nesting birds are particularly vulnerable. The eggs of the quail are at highest risk because ground squirrels consider those to be the absolute best treat in the world. If they don’t have access to their favorites, ground squirrels can turn to other kinds of food in an attempt to ensure survival. Tree barks and twigs will have to do in times when fruits and veggies are sparse. Gnawing on bark happens to be quite entertaining for ground squirrels and they may get engaged in the behavior even if other food happens to be plentiful. When there’s no other food around, ground squirrels may attack small vertebrates and eat insects. The ground squirrel isn’t picky – it’s going to eat just about any insect that it can get its little paws on. The squirrel is identified as a hunter and gathered. This means that the rodent is pretty flexible when it comes to meals. It will make use of whatever’s available at the moment without worrying too much about the taste. If your garden is endangered by ground squirrels, you can deal with the issue in an easy and humane manner. One of the options involves installing a feeder. Ground squirrels that have their bellies full will probably leave your fruits and vegetables alone. Alternatively, you can set traps and place delicious treats inside. 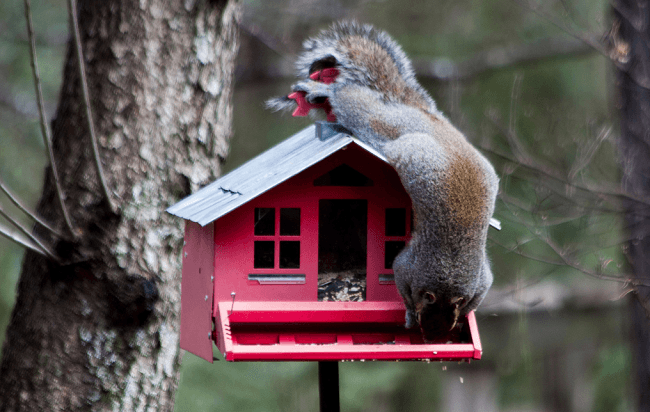 Capturing the squirrels and releasing them away from the garden will help you get the issue dealt with in an environment-friendly way.